CWGC Thiepval Memorial, and the French cemetery. The first day of the Battle of the Somme (1917) alone saw over seventy-thousand casualties. By the end of the battle, there were over a million soldiers and officers wounded, killed, or missing in action. 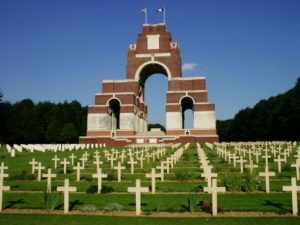 The immense CWGC memorial in Thiepval commemorates the missing 72,337 British and South African servicemen – a mere fraction of the total casualties. It is the largest Commonwealth memorial to the missing in the world. Emma will sing at the Royal British Legion’s remembrance ceremony at Thiepval on the anniversary of the first day of the Battle of the Somme on 1stJuly. She will also sing at the Ulster Tower where the Irish service men are commemorated, and during a tattoo in Arras on 30thJune.